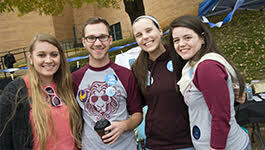 The mission of the Career Center is to assist Freed-Hardeman University students and alumni with their career development and their transition from college to their career. The Career Center will provide the highest standards of services so FHU students and alumni may successfully meet the challenges of a competitive job market. Career decision making is a process that will have major implications for students for a lifetime. The Career Center provides a successful bridge between students' academic preparation and entering their chosen career field. The Career Center looks forward to working with students and alumni on their career development plans and helping employers meet their employment needs. Be sure and contact our office for additional career information and resource.